You’ve made the decision to remodel or construct a patio for your MA home. You may even have a clear idea of the completed project, or a design in mind, but there is still choice left to make. Natural stone or concrete pavers? It’s time to analyze their qualities to determine the best option to suit your needs. A variety of shapes, sizes, and textures are available depending on the stone used. The rugged lines and lack of symmetry of natural stone gives an earthy feel to a patio that is hard to replicate. This allows for a patio that feels as though it were crafted by nature. With many natural stone options, color variation, both between different pavers and within individual pavers, is also extremely high. The right shades and hues can create a beautiful patio that complements the rest of your outdoors with its natural colors. Every piece of stone has its own unique look, from years of natural aging and weathering. This gives it an intense character, which ensures uniqueness and unrepeatable combinations of color, texture and pattern. As far as functionality goes, natural stone is very durable. Stone is affected by weathering, however, and some degree of color fading may take place over time. Of course, not all natural stone is created equal. Limestone, for example, is relatively soft and although it creates a pleasing, relaxed atmosphere, will require some maintenance and may not be suitable for heavy duty purposes. Granite on the other end of the spectrum is hard and dense, and capable of handling extreme weather and weight pressures. Sandstone, flagstone and bluestone are all excellent multi-purpose natural stone that offer natural charm and can serve for heavy duty areas provided the stone is of a sufficient thickness and quality. Being manmade, concrete pavers can be found in virtually any shape, size, color or texture suited to your needs. They can also convincingly mimic the look of stone and brick. This allows for an extremely high level of flexibility when designing your patio. Specific concrete pavers are designed to match with any number of backyard themes, be it contemporary, historical, Mediterranean, or anything else in between. Concrete pavers are extremely strong and will last for many years without any maintenance. If damage does occur to a paver, it can be individually replaced without any need to tear apart an entire area. The weight bearing capabilities of concrete pavers is also extremely high, and many are treated against fading, chemical damage and staining. Both options are sturdy and low maintenance, which makes them both good long term investments. The main differences lie in their availability and cost. Concrete pavers are not subject to limited availability from quarries. They incur lower travel costs and are generally less expensive than natural stone. Of course, many still prefer the authenticity offered by natural stone. The choice between the aesthetic benefits of authentic natural stone and the practical benefits of concrete pavers is therefore entirely yours. This entry was posted in Design & Construction and tagged Concrete Pavers, Landscape Design, Natural Stone, Patio on May 31, 2017 by 12850420. 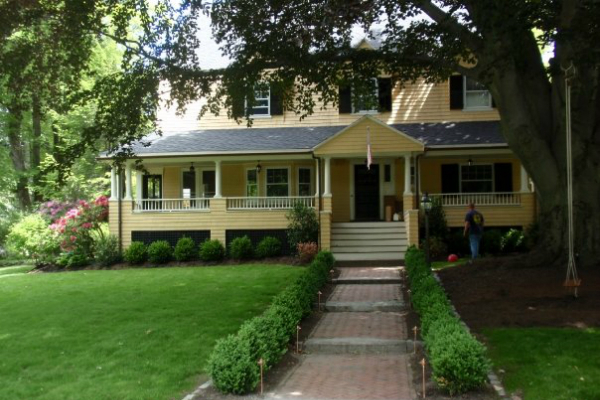 Your front yard in Milton, MA is the focal point of its curb appeal, and it should definitely make a statement. Adding curb appeal to your home is crucial for current or future sale, but is also a great way to showcase the personality of your home. By enhancing the best features of your home you can instantly increase its monetary and aesthetic value. Here are some tips to boost your home’s curb appeal with landscaping. If you don’t have plants around your home, now is the time to seriously consider adding some. Depending on the style of your hardscape and your home, consider their texture, shape, size, growth speed and bloom time. If you want an immediate curb appeal boost, try adding a variety of annual plants with varying bloom times, ensuring year round color. This will give an instant lift, add color, and make your home look pleasant and more alive. Flower boxes are also a great idea, especially if your home is lacking color. You can place them under your windows or along the edges of hardscaped areas. Plants used as focal features can continue to add appeal even after dark through the addition of landscape lighting. Lighting is an important factor for your home. As well as adding evening curb appeal, landscape lighting contributes to safety, security and ambience for your outdoor living spaces. Use lighting to accentuate the best features of your home and your landscape. This will increase the value of your home and make it look more attractive for potential buyers. However, there are some major mistakes to avoid with landscape lighting as improper lighting can achieve the opposite effect. Make sure the fixtures are properly placed and installed by a reliable contractor with experience in creating evening atmosphere – this will help you to avoid creating glare and a washed out look. With an effective lighting plan for your walkways, driveway and front entrance, you can leave a lasting impression on visitors. If you’re noticing damaged pavers, cracked concrete or spalling stone in your front yard hardscaping, it may be time for an update. As well as front patio and driveway revamping, you may also want to consider a remodel of more overlooked aspects of your front yard. Steps are an important part of your home’s curb appeal and present both a vertical and horizontal surface that draws the eye. 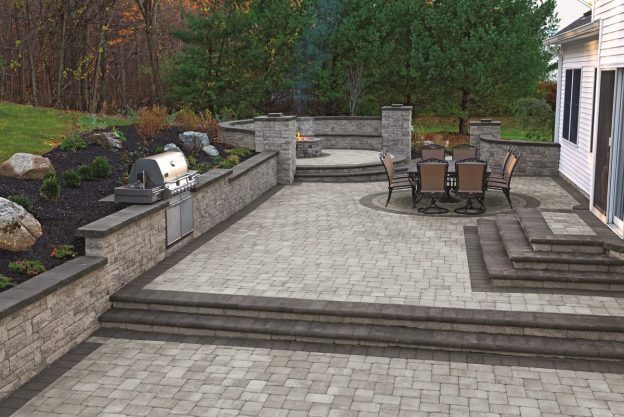 Walkways and retaining walls are also crucial features for increasing curb appeal and present the perfect opportunity for showcasing quality natural stone or concrete products. Your front entrance should be well balanced and have a great dynamic when interacting with the aesthetic of the rest of your front yard. Use your softscape, either symmetrically or asymmetrically, to lead the eye to your front entrance of your home. Your front entrance can and should be the focal point of your front yard, so incorporate accents that are relevant to the rest of your front yard to tie in the design. This entry was posted in Design & Construction and tagged Curb Appeal, Driveways, Front Entrance, Landscape Design, Outdoor Lighting, Plantings on May 31, 2017 by 12850420. Let’s face it: from December to February, nobody wants to stay outdoors for too long in Milton, MA. But that’s only a quarter of the year and you have no reason not to enjoy the outdoors during the months remaining – especially if you have an outdoor fireplace. Regardless of the style of fireplace you opt for, a crackling fire not only gives your landscape a luxurious look, it also brings feelings of comfort and coziness. Fire features are a key element in keeping alfresco activities going even after the temperature drops. So, get ready to transform your outside space and check out the ideas we have gathered to give you some inspiration. Chances are you already have some sort of hardscaped area in your backyard. Fortunately, an outdoor fireplace can easily be added to an existing patio or paved surface, provided it rests on a strong foundation. A fireplace made of either natural stone, or concrete units designed to replicate the coloring and texture of natural stone, can give a huge boost to the aesthetic of an existing patio, adding character and a stunning focal point. Whatever building material you select, adding accents to your fireplace design to reflect the colors of your surrounding elements can help tie the patio and outdoor fireplace together. This can help make it seem as if the fireplace has been standing since the initial construction of your patio. There’s no reason to have to choose between an outdoor fireplace or a pool. Not only can you have both, the two are perfect complements to one another, allowing an extension of time by the pool and the enjoyment that comes with the ambience of both. As a warm day slips into a chilly evening, you can go from an afternoon at the pool into a warm evening around the outdoor fireplace. Consider adding futons or other comfortable and inviting seating options to smooth the transition from one outdoor space to another. Permanent seating is also a great option, providing ample space and a place to dry off around the fire after a swim. Who said that a fireplace has to have the traditional look? The benefit of a custom outdoor fireplace design is that your fireplace can have basically any shape you want within safety and regulatory parameters. Modern fire features are often integrated into walls or vertical structures and follow straight, clean lines with a horizontal emphasis. The design of a custom outdoor fireplace can also be adapted for accessible firewood storage and incorporate personally selected materials to match the style theme of your outdoor spaces. If you’d rather go for something simple, a fireplace kit can do the job. A common misconception is that kits look cheap and mass produced. However, there are a variety of kit options out there from trusted brands. Kits can also offer some room for customization and have the advantage of a guarantee and quick installation. This entry was posted in Design & Construction and tagged Landscape Design, Outdoor Fireplace, Patio, Swimming Pools on May 16, 2017 by 12850420. Retaining walls are well known as protective structures, primarily built to hold back slopes and prevent soil erosion. However, that doesn’t mean that they can’t have an aesthetic purpose as well. When designed and constructed correctly, retaining walls are not only functional but also beautiful. They can bring new dimensions to a landscape and add up to the aesthetics of your Scituate, MA property. It is a common misconception that a retaining wall has to hold the weight of the mass of soil behind it. In fact, these walls are built to hold back the wedge of soil in contact with its lowest part. If the wall is well constructed, the soil used to fill the space between the structure and the sloppy soil being held back won’t push against the wall at all. Always talk to specialized professionals when having retaining walls installed to ensure your wall is engineered to do its job the right way. It is common for landscapes surrounding homes to be uneven, especially in high rainfall or marshy areas. A retaining wall can be used to prevent erosion caused by rainwater, stopping precious topsoil from being washed away and leaving your yard bare. Retaining walls can also act as a barrier between steep terrain and your pool, preventing rainfall from washing soil or other debris into the clear water. Consider having the retaining wall built with materials that complement the pool deck to ensure your poolside hardscaping looks well coordinated and complete. Often called seawalls even when they are not built close to the sea, retaining walls can also separate land from water. If you have a small lake or stream running in your property, a retaining wall can prevent the soil from getting too moist, eventually causing trouble for nearby structures. However, be aware that when it comes to installing retaining walls to hold back water, you or your contractor generally need to apply for permission from your local authorities. Terracing is a technique often used for steep, unusable farmland – whole mountainsides are cut into steps supported by retaining walls to allow for the growth of crops on the flat portions of land. On a smaller scale, terracing can also be used to facilitate wider access to a landscape with significant portions of inaccessible or unsafe sloped terrain, through the creation of multiple levels of usable space. These can be utilized as functional outdoor rooms, connected with walkways and stairs that take guests on a journey through your backyard and its individual gathering spaces. Retaining walls don’t have to be purely functional elements that you tolerate due to their usefulness. Make your retaining walls aesthetic features of your landscape, either through the use of stone veneer and coping, or by painting plastered walls to complement your landscape color scheme. Retaining walls can also hold raised plant beds for flowers and shrubs, or have integrated water features. This entry was posted in Design & Construction and tagged Landscape Design, Retaining Walls on May 6, 2017 by 12850420.